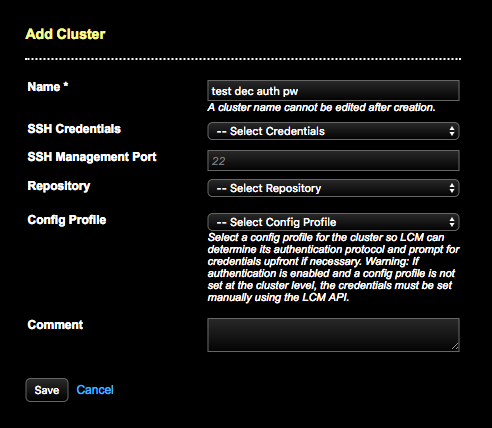 Edit cluster details such as the configuration profile associated with a cluster and run a job to update a cluster. Add a cluster to centrally manage installations and configurations within Lifecycle Manager (LCM) for DataStax Enterprise (DSE) clusters. By default, all datacenters within a cluster inherit the configuration profile from the cluster level, unless overridden when creating the datacenter model. By default, all nodes within a datacenter inherit the configuration profile from the datacenter level, unless overridden when creating the node models. SSH settings can also be inherited or overridden at the datacenter or node levels. Repositories are only specified at the cluster level and are inherited by datacenters and nodes. If authentication is enabled in the configuration profile associated with a cluster, prompts recommend changing the default password of the cassandra user. After selecting a configuration profile that includes cassandra.yaml settings to enable the internal or password authentication scheme, the Add Cluster or Edit Cluster dialog prompts for old and new passwords for the built-in CQL user named cassandra. The cassandra user is present by default in the internal authentication scheme, and has a publicly known default password of cassandra. LCM changes the default cassandra password using the supplied password fields. Warning: It is a security risk to leave the default cassandra password in place. Change the default password to prevent unauthorized access and avoid security breaches. Important: When enabling node-to-node encryption on an existing cluster, the cluster will experience a network partition during the transition, leading to temporary loss of consistency. If possible, choose whether to employ node-to-node encryption when first creating the cluster. See Configuring SSL/TLS for DSE using LCM. Click Clusters from the Lifecycle Manager navigation menu. If you have not created any clusters, click the Cluster link on the Getting Started page. Click the plus sign icon above the Clusters pane. The Add Cluster dialog displays. Enter a unique name for the cluster. The name reflects the cluster name in both DSE and LCM. Note: The cluster name cannot be edited after clicking Save because LCM populates the cluster_name field in cassandra.yaml with the entered value. Select predefined SSH Credentials to use for accessing the machines that nodes reside on. Optional: Specify an SSH Management Port to override the default of 22. Select a predefined Repository from which to access DSE install packages. Datacenters and nodes inherit the repository from the cluster level. Defining a repository for the datacenter or node level is not necessary. Select a predefined Config Profile to apply at the cluster level. If configuration profiles are not defined for datacenter or node levels, those levels inherit from the cluster. Select a configuration profile at the cluster level so that LCM can determine any authentication protocol and prompt only once for credentials instead of at the start of every job. Warning: If authentication is enabled, the required credentials must be set prior to running the job. Not doing so causes LCM to fail registering the cluster automatically with OpsCenter monitoring. Set the credentials within the Add Cluster or Edit Cluster dialogs in the LCM UI, or set old and new passwords using the LCM API. A prompt indicates that internal or password authentication is enabled (the default for LCM security settings), and password fields display. For an initial install, set the Old Password to cassandra. Click the tooltip icon for more information. Optional: Enter a descriptive comment about the cluster. Example: Dev cluster, or Prod cluster. The newly defined cluster displays in the Clusters pane. Click the cluster title to view its details, which opens the Datacenters pane. Add another cluster. Repeat this procedure as necessary. Add datacenters to the cluster. Add nodes to the datacenters. Run an installation job. After Lifecycle Manager successfully creates a cluster during an install job, LCM automatically adds the cluster to the OpsCenter workspace for monitoring and management.